It’s February, so it is cold outside. Hot chocolate always sounds good when it is like this. What is more fun right now than planning some Valentine’s Day Hot Cocoa for yourself or to give as gifts? Here are 20 ways to enjoy it for the holiday. Here are some hot cocoa recipes that enhance the chocolate flavor in some way. Chocolate Cherry Hot Cocoa – A Cultivated Nest likes to serve up this homemade hot chocolate in heart mugs. Use cocoa powder, chocolate chips, a bit of vanilla extract, and some maraschino juice for the cherry flavoring when you mix it in milk. Chocolate Covered Cherry Hot Chocolate – Tastes of Lizzy T starts with maraschino juice and then brews a K-cup of Starbucks hot chocolate. Top it off with whipped cream, shaved chocolate, and a maraschino cherry. Red Velvet Hot Chocolate – Red velvet cake is fantastic, so you know this hot chocolate also will be. In fact, My Recipe Magic uses a bit of red velvet cake mix for the flavoring. Strawberry Sweethearts Cocoa – Two Peas and Their Pod uses strawberry ice cream for added flavor in this drink, making it like hot cocoa and a strawberry milkshake had a baby! French Hot Chocolate – When you think of France, you think of romance. And chocolate over there just tastes better. This recipe from Well Plated uses whole milk and heavy cream to make the melted chocolate even creamier, and recommends espresso powder for an added kick and flavor. Hot Chocolate on a Stick – Milk chocolate, honey, vanilla, and your choice of milk are melted together and then frozen in a mold with a stick in it. Sugar and Charm has then stirred the sticks into all kinds of milk and then added different toppings along the way. Cardamom Hot Chocolate with Rosewater Marshmallows – Add cardamom to your hot chocolate for a bit of an added kick. Then The Baking Bird teaches you how to make your own marshmallows made with fresh rosewater. White chocolate is the perfect alternative to darker chocolate, and is actually preferred by many people. These are a few fun white hot chocolate recipes that will hit the spot this holiday. Raspberry White Hot Chocolate – Use raspberry extract to give the melted white chocolate a fruity kick in this recipe from Sweet Lil You. Conversation Heart Cocoa – Smart Schoolhouse uses strawberry Nesquick and white chocolate chips as the white hot chocolate base and then dips the rim of the mug in crushed conversation hearts. Strawberry Hot Cocoa on a Stick – I love this idea on Betty Crocker. Melt white chocolate chips and mix with strawberry mix before letting the mixture cool in silicone molds with spoons. When you’re ready to make your drink, you stir them into hot milk. Pink Velvet Hot Chocolate – This one by Dorky’s Deals gets its velvet flavor from strawberry syrup or strawberry puree and cream cheese all mixed with the white chocolate. It just sounds fantastic. Chocolate is meant as a symbol of love, so what greater gift to give for Valentine’s Day? And because it is cold outside, I would definitely go for a hot cocoa gift. I mean, practicality is just as much of a good idea. Cupid’s Cocoa – Make a baggie that holds a packet of hot cocoa, pink and white marshmallows, and then top it off with this printable from Nellie Bellie. You Warm My Heart Valentine – Dip spoons in melted chocolate and sprinkles to put in a bag with a packet of hot cocoa and marshmallows. And then this one can be topped off with a printable from 11 Magnolia Lane. 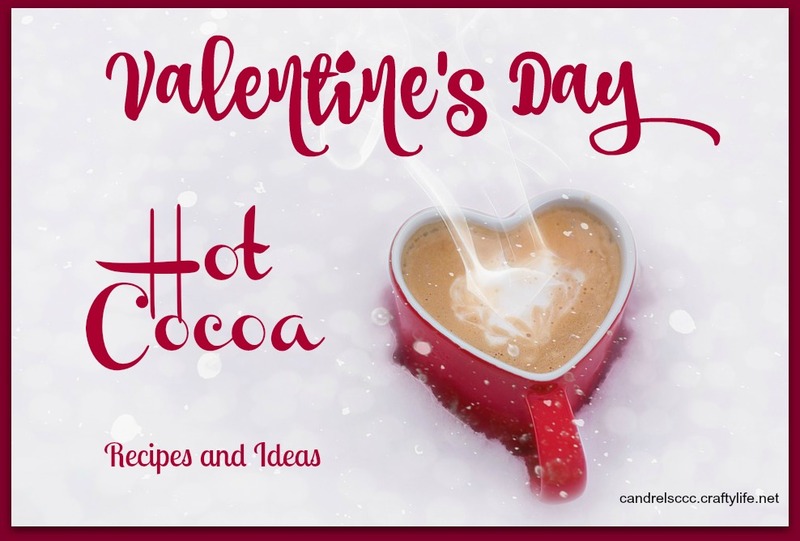 You Warm My Heart – Make a homemade hot cocoa mix that you place in a mug and add this printable from Unexpected Elegance. Valentine’s Day Hot Chocolate Mix Mason Jar – Cutefetti has these layered jars that also include pink sugar. A new trend is setting up a hot cocoa bar in your home, so that people can make their hot chocolate the way that they want. Here are a few ideas for inspiration. Valentine’s Day Hot Chocolate Bar – Stone Gable Blog set up a rustic looking area, complete with bandannas as cozies. After pouring hot chocolate, use a chocolate spoon for added chocolate and then top it off with sprinkles, candy hearts or marshmallows. You can see her recipes and tutorials on her site. Valentine’s Day Ideas for a Hot Chocolate Bar – Sweet and Simple Living likes to set this up for when the kids come home. She likes to do things like cutting out heart shapes from jumbo peppermint marshmallows and then filling them in with melted chocolate. You can also coat marshmallows and spoons with chocolate. Use her free printable to tie it all together. Valentine’s Day Hot Cocoa Bar With Pink Hot Cocoa – Dukes and Duchesses sets up a hot cocoa bar with whipped cream, heart shaped marshmallows, red hots, and sprinkles. Follow her instructions for some fun decorations in the background, as well as other fun hot cocoa bar ideas. Hot Cocoa Bar and Marshmallow DIY – Oh Happy Day sets up her bar with four different flavors of hot cocoa, lots of toppings, and plenty of homemade marshmallows. She teaches you how to make striped marshmallows right at home for a customized fun topping. Hot Cocoa Bar for Valentine’s Day – There are so many things that you can put on top of your hot cocoa, like peppermints, peanut butter cups, more chocolate. ReMarkable Home has all kinds of fun ideas, plus free printables to help you label your bar.